As you can see the chart, it was a voting system created by LINE Event based in Malaysia. It showed us a statistic favored Spain rather than Netherlands. 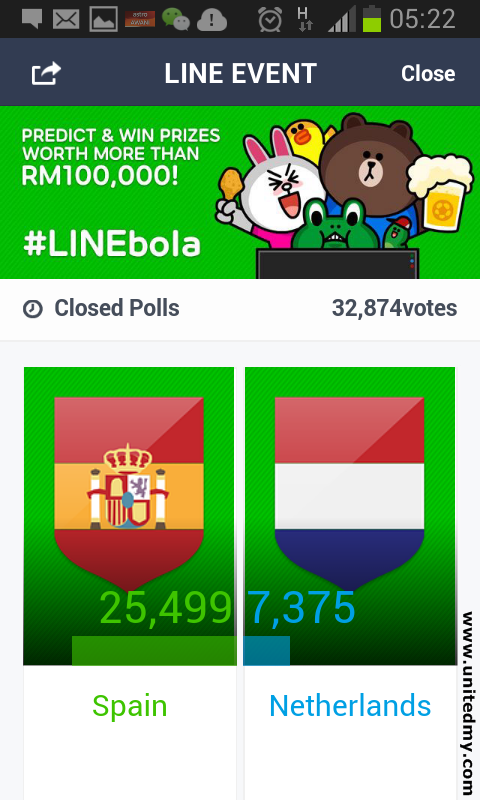 More than 32,000 votes have been collected before the match ended yesterday 5AM Malaysian time. It is a cant-miss FIFA World Cup match between Spain and Netherlands. There are many reasons and most profound one would be they were in the final match FIFA World Cup 2014. Watching this match made us feel nostalgic. Although Spain won the last FIFA World Cup, in this FIFA World Cup 2014 first match they are up defending against Netherlands again. Coincidence or just some people behind putting a good show ?? The Brazilian stadium was filled with supporters from both sides. Listen clearly Holland is seem to have larger crowd of supporters. When Spain attacker marching in there were a series of boo sound from the top platform. Besides, Spain supporters are wearing red shirt and Netherlands supporters are wearing orange shirt. There were merely 7,000 Malaysian thought Netherlands will win against Spain. They were right. The unprecedented score so far Netherlands 5 - 1 Spain. Practically, Spain scored 1 with the help of penalty kick. Netherlands played well and performed tremendous sport spirit. First goal by Netherlands was by a outstanding and amazing diving head V Persie. Do not be disappointed because we will still get to see Spain versus Chile. As for Netherlands, they will up against Chile on June 24, 2014 Malaysian date. Moreover, the strength of Chile cant be underestimated since Netherlands and Spain have a match with Chile. Who will eventually win Chile or it will be a twisted ending Chile will win both Netherlands and Spain. It is not most of the Malaysian favored Spain. Malaysian Prime Minister when addressing at Invest Malaysia conference said " although Brazil is a strong team performing in his place but I am confidence Spain will win "
What will be your decision ?